The original goal for this blog was to create a character for every RPG I own. Somewhere along the way it became a general RPG blog, and then based on popular response, the whole thing became focused on my map-making. Then I got an email to go check out what Jensan has been doing. He used to be the host of another RPG blog called Rustfoot which he no longer updates. But he’s been making characters for all kinds of free RPGs. Better than that, he’s doing it in an uber-cool way, drawing up the character sheets himself with commentary right on the sheet as he goes (or using the character sheet that came with the game). So, without further ado, Jensan will be posting these awesome free RPG characters here for your enjoyment. The first of such is for the Dead… and Back RPG by Chainsaw Aardvark. Thank you for featuring me, and first no less! I have really enjoyed your various characters. A new character sheet to go with a new edition of D&B is in the works, hopefully to be ready soon. Thanks again for the new readers. Very cool! I hope to see more of these, and maybe more characters from Dyson! While I agree that the copy permission note is sometimes annoying, without it there are many copy shops which will refuse to copy the sheet. I have gotten into that exact argument. The permission note in the book’s copyright statement almost wasn’t enough, they really wanted a permission note on each and every copyable page. What was this reaction about? 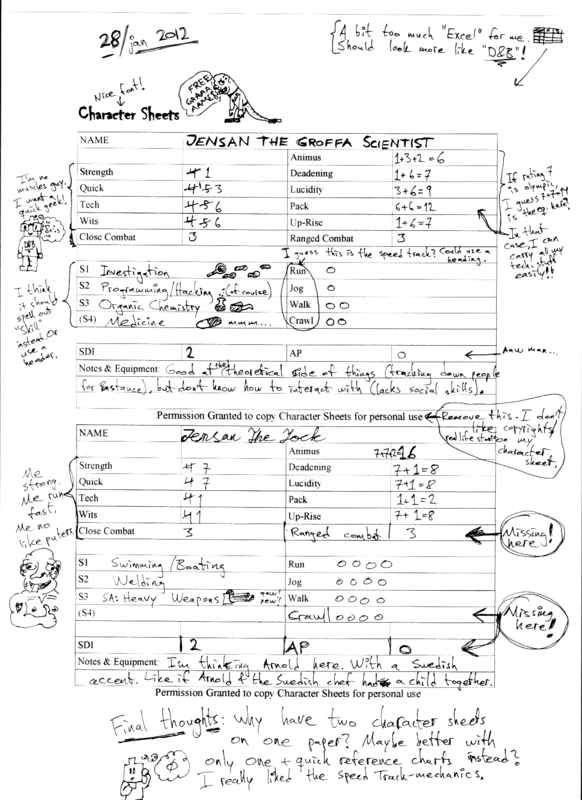 Very Neat, Jensan, but do you think you could provide a character writeup like Dyson used to do alongside the sheets? I’m always interested more in how people design their characters alongside the mechanics – less so about the character sheet. The thought behind these was to focus entirely on the character sheet, and not so much on the actual process of building a (decent) character. But it would be fun if Dyson did a version too, with a detailed writeup like he used too.